One of the best benefits to traveling is when history makes the leap from the pages of history books to real life. There is often something magical about the moment you set your eyes on something you have only heard about or seen pictures of in a magazine or on a computer screen. There are some places that are devoid of that joy, though; the magic is replaced by sadness, anger, or the sinking feeling that you are about to face a past you wish could be rewritten, not revisited. 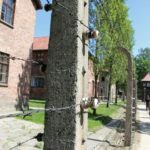 I insisted that we visit Auschwitz when Adam and I traveled to Poland, but yet it was not a visit I looked forward to making. 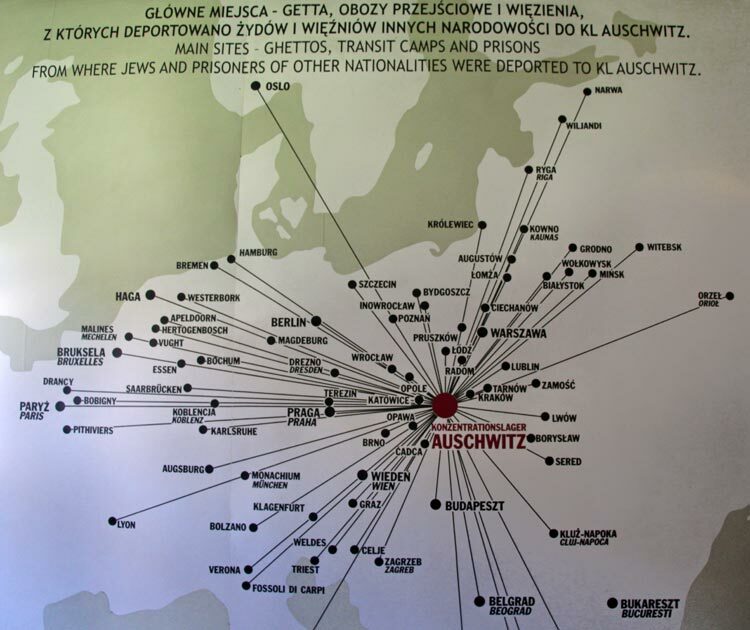 Auschwitz represents one of the most horrible chapters in our history. 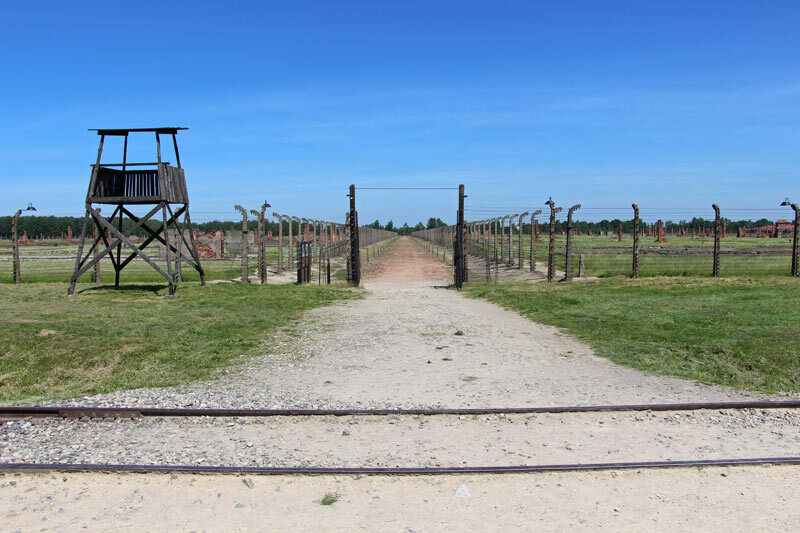 We owe it to those who perished during the holocaust to learn about it, remember it, visit the places where so many were imprisoned and murdered, and promise that we won’t allow such horrors to ever happen again. Like many students I read Anne Frank’s Diary of a Young Girl in middle school and was shattered when I learned that she didn’t survive her imprisonment. How someone so bright and full of promise, whose diary was in many ways relatable even 50 years after it was written, could be subjected to conditions that ultimately claimed her life broke my heart. I never forgot the impact her book had on me. Her story was just one of the stories belonging to the 1.3 million people who entered Auschwitz’s gates between 1940 and 1945, though. For 1.1 million of those people, their stories ended there. My visit to Auschwitz reminded me that just because their stories aren’t part of a school’s curriculum does not silence or negate them. 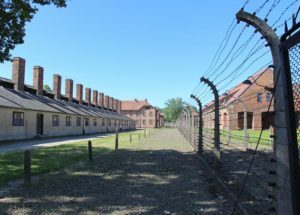 When you visit Auschwitz, you can practically hear those stories whispered in each building, murmured around every corner. Remember us, they say. We mattered. 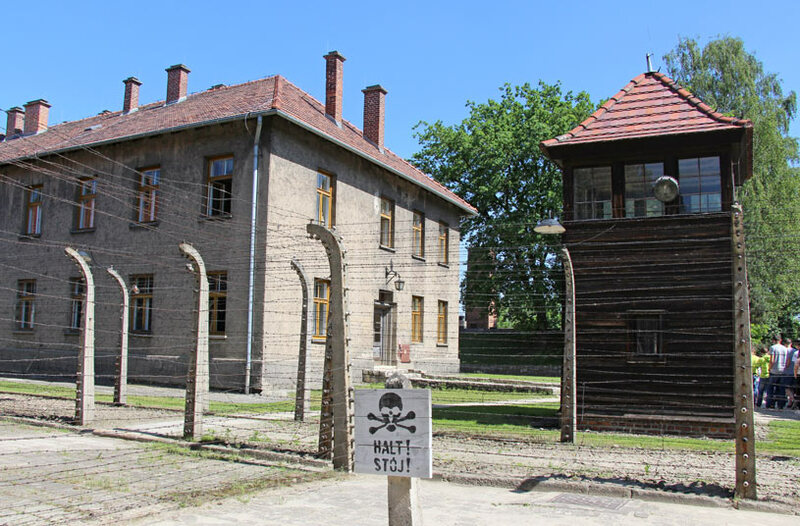 Although there are public transportation options that will take you to the town of Oswiecim, we opted to join a tour that took us from Krakow’s Stare Miasto directly to Auschwitz, which saved us a bit of time (important, since we arrived at our Krakow hotel very, very late the night before our visit). Auschwitz is a very popular tourist destination, and bus after bus rolled into the parking lot, unleashing hundreds of tourists into a general waiting area where we were split into groups based on our language needs. We passed through a security checkpoint similar to those found in airports, and we were issued headsets that tuned to a channel so we could hear our guide during the tour. Our group was large—about 30 people—so headsets were necessary to prevent our guide from needing to yell and to drown out the commentary from other guides in our vicinity. Around us were equally large groups with tours given in German, Spanish, and French, so it was helpful to be able to tune out the other tours and focus solely on our guide. 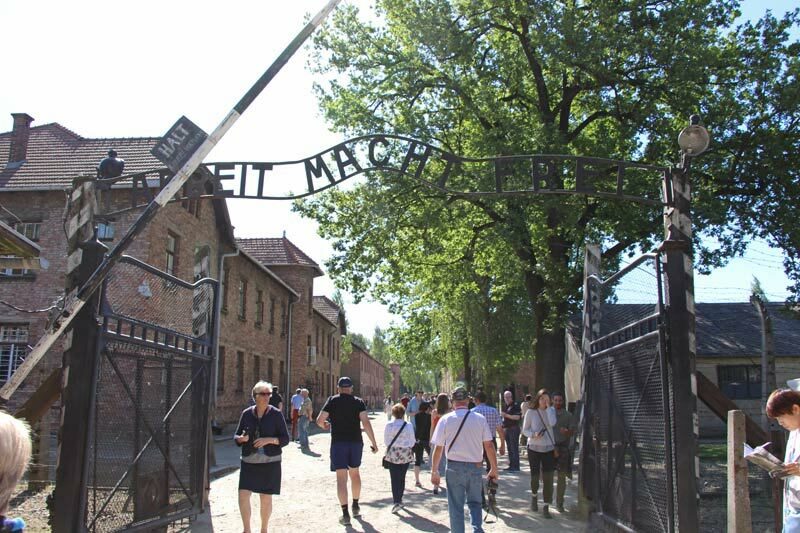 Tours begin with visitors passing beneath the infamous gate with Arbeit Macht Frei—work sets you free—in large letters overhead. Many concentration camps had similar gates, and prisoners passed through them daily. The Nazis incorporated the phrase into their propaganda, encouraging their captives to believe that their hard work would eventually secure their freedom to return to their previous lives. The prisoners likely viewed it as more of a sick joke; most people knew that when they passed through those gates their freedom would only be attained through death. Walking through the gate was a horrible moment. I knew it would just be a couple of hours before I would depart from the grounds, and I couldn’t shake the gripping realization that I walked in the footsteps of so many innocent people who were forced to stay there for months—even years—before their deaths. 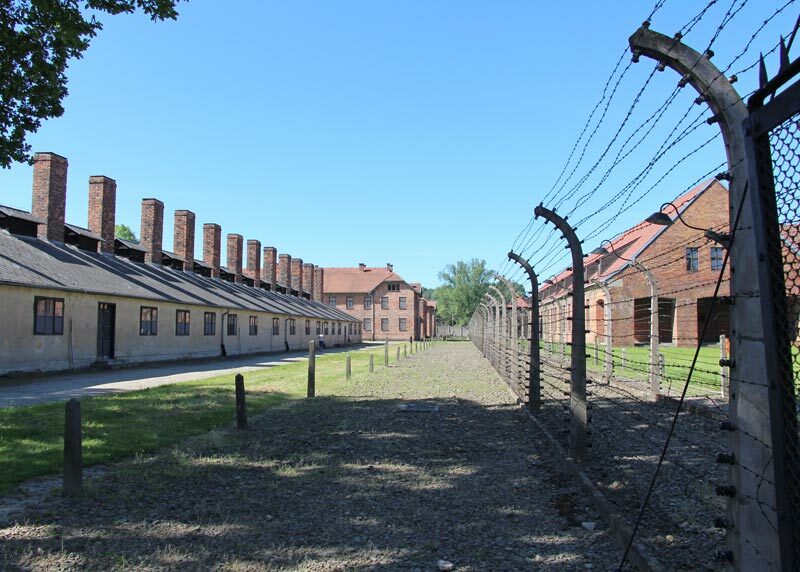 For most people, a visit to Auschwitz reinforces information previously learned in school or through research. 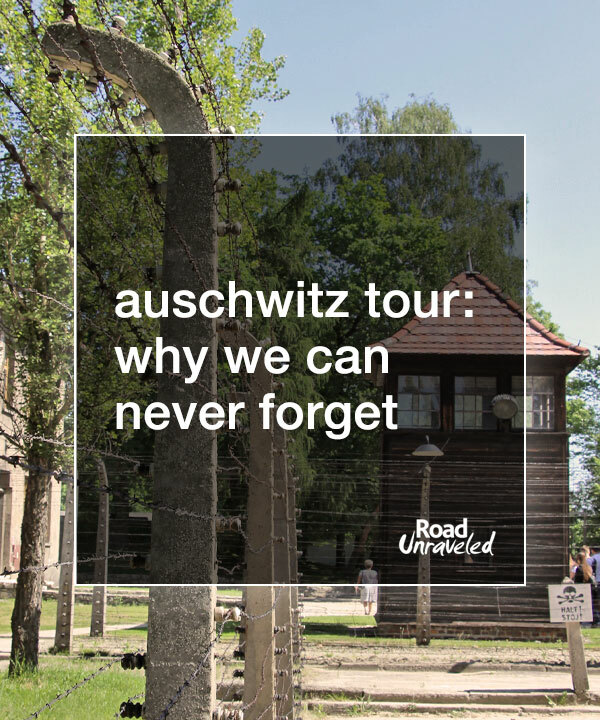 Our guide shared dozens of facts about the populations imprisoned at Auschwitz, the conditions they endured, and the ways in which they were mercilessly and unceremoniously killed. 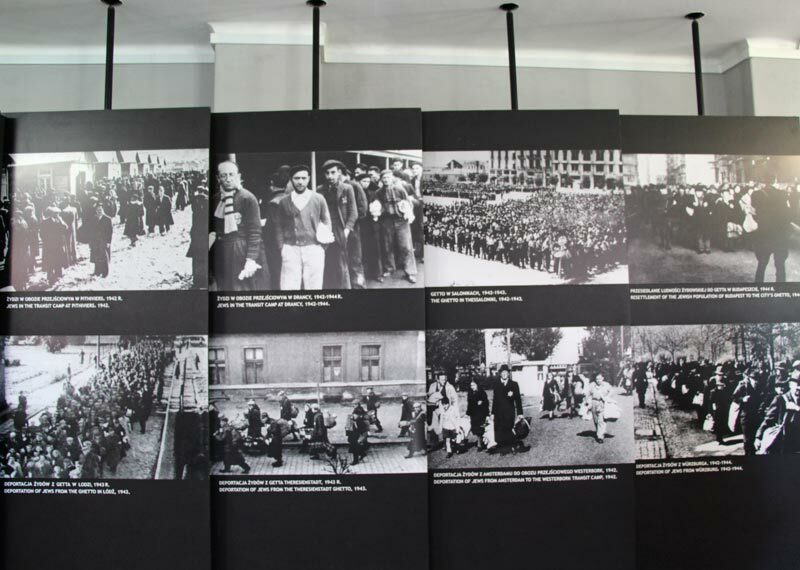 The prisoners were predominately Jewish, although other people from all over Europe were targeted as well. 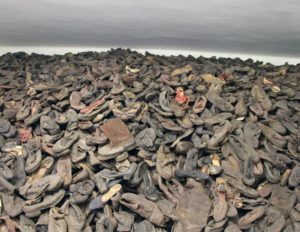 Most people were killed in gas chambers. Hundreds of people were packed into the chambers, and when the rooms were full, they were sealed and filled with gas made from Zyklon B pellets. The gas led to a very painful death over the course of 20 minutes. I had learned these cold, cruel facts before I arrived. Hearing them again was not the worst part of the visit. What haunts me still are the exhibits I saw revealing the personal artifacts that the prisoners brought with them to Auschwitz. I saw hundreds of suitcases with names, addresses, and birth dates so optimistically printed on them, a clear demonstration of hope that their owners would someday be reunited with them. 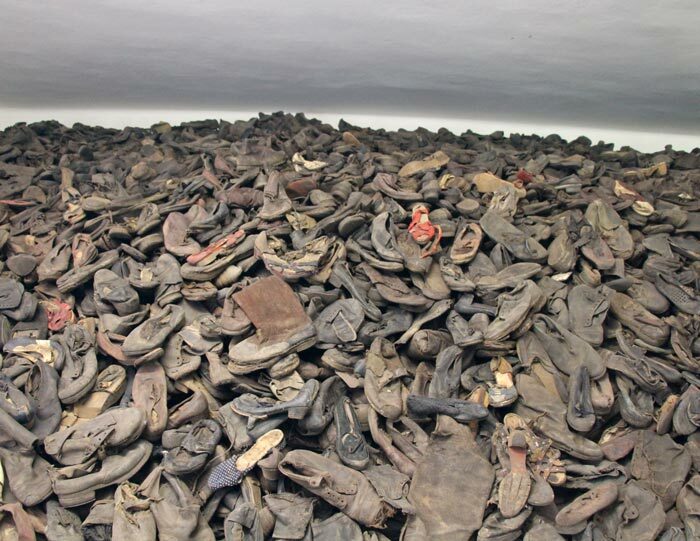 An enormous display case of shoes broke my heart; that mountain of footwear carried people to the final moments of their lives. 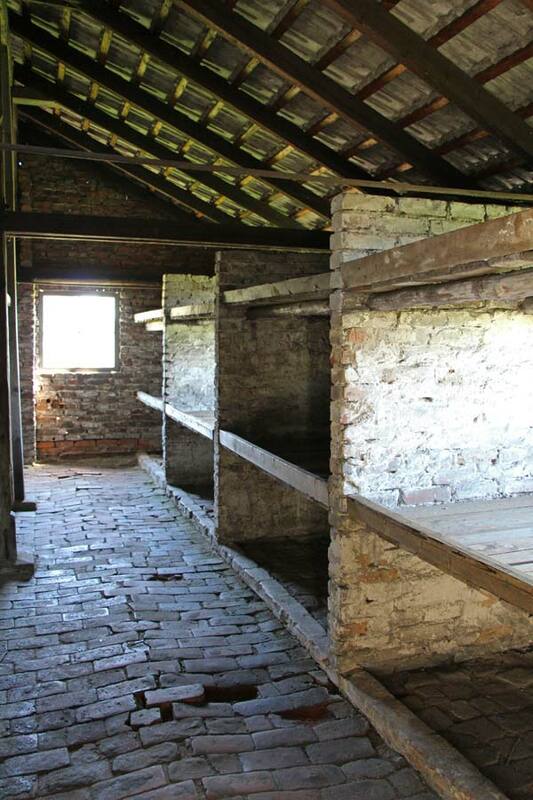 One room was filled with nothing but human hair, shaved from prisoners’ heads and later used to make socks, shoe liners, and blankets for the Nazis. A long corridor fully lined with photos left me nauseous; each face was accompanied with the person’s name, date of arrival, and date of death—either after succumbing to illness or exhaustion or because he or she was executed. Face after face, hundreds of sets of eyes reflecting their resignation to their fate. For almost everyone, just a few months separated their arrival from their death. 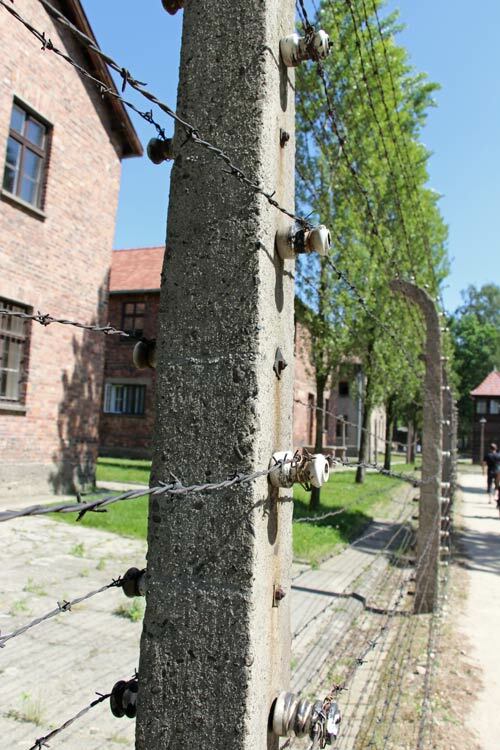 Our tour of Auschwitz took us through and past otherwise unimaginable sights. 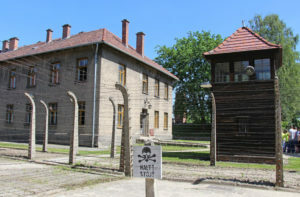 Outside of Block 11, the stone Wall of Death reconstructs the location where some prisoners were shot, a quicker termination than in the gas chambers. Inside, we passed several types of torture cells, including standing cells where four prisoners at a time were locked into a space so small they couldn’t lay down. Those same prisoners would still have been forced to work the following day, and that punishment sometimes lasted for weeks. Not far away, some cells locked prisoners into complete darkness with no ventilation, leaving them to suffocate. Still worse were starvation cells, where prisoners were locked away and only removed after their death. The tour concluded with a completely silent walk through a gas chamber. Out of respect for the victims, visitors are asked to remain quiet during the few minutes they spend inside, and with the exception of a few muffled sobs the silence is deafening. A short bus ride shuttles visitors to Auschwitz II, better known as Birkenau, In contrast to the rows of brick buildings that make up Auschwitz, Birkenau is largely open and outdoors. We walked from the entrance down a long road, stopping at where an old train car stands at the end of its track. 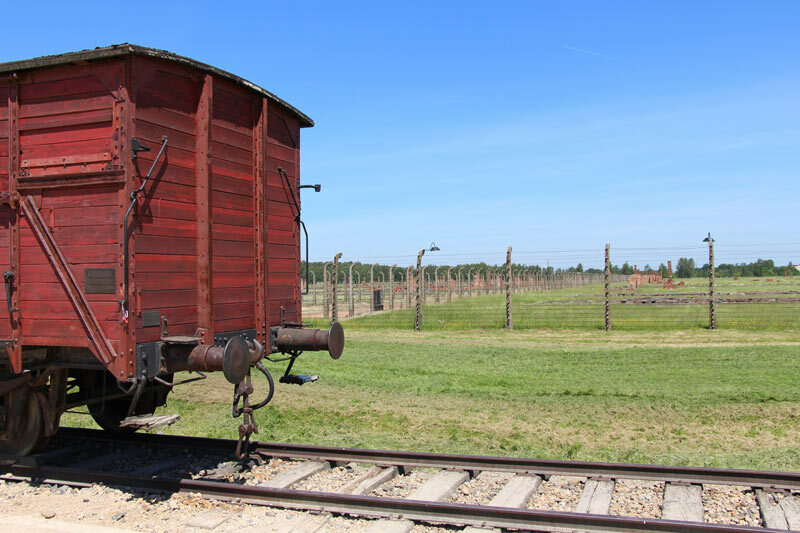 Our guide explained that the Jewish prisoners were loaded onto train cars and shuttled to Auschwitz, a journey that took as long as 7-10 days, without stops, meals, or access to restrooms. Prisoners arrived exhausted, malnourished, and soiled, and still others did not survive that journey. Upon arrival, Nazis standing in as doctors made an immediate judgment regarding a person’s ability to work via a quick visual assessment. Without performing any kind of physical, people deemed fit enough to be spared were sent to the camps, while everyone else was directed to remove their clothing and enter the gas chambers. Living conditions were deplorable. We walked through one of the barracks where up to 1,000 people were forced to sleep in wooden bunk beds that were stacked from floor to ceiling. Up to six people would share each level of the bunk bed, which was no larger than a queen mattress. Spaces on the top level were preferred, as they benefited from better airflow than spaces on the floor. 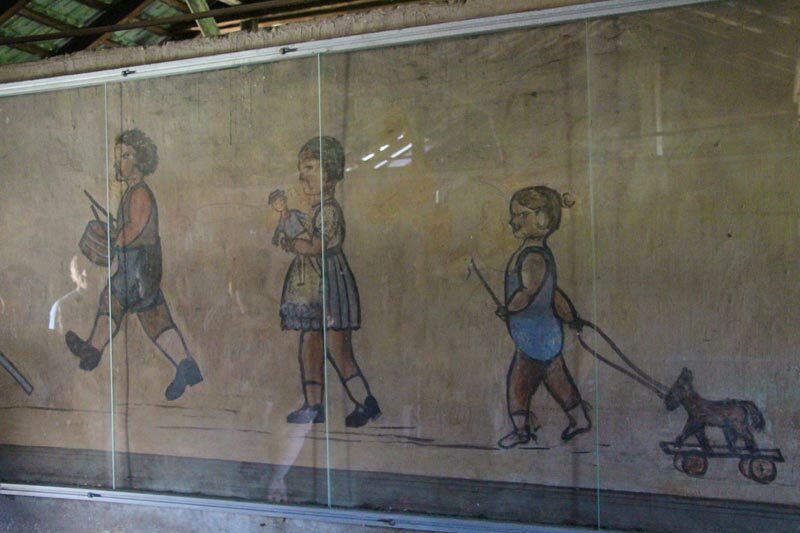 It was in the barracks that we saw a glimmer of what could only be interpreted as hope; a painting depicting children playing with toys adorned the wall. While no one is completely sure of the origin of that painting, our guide offered that it might have been added by the prisoners to give hope to their children that freedom and a return to childhood were possible. 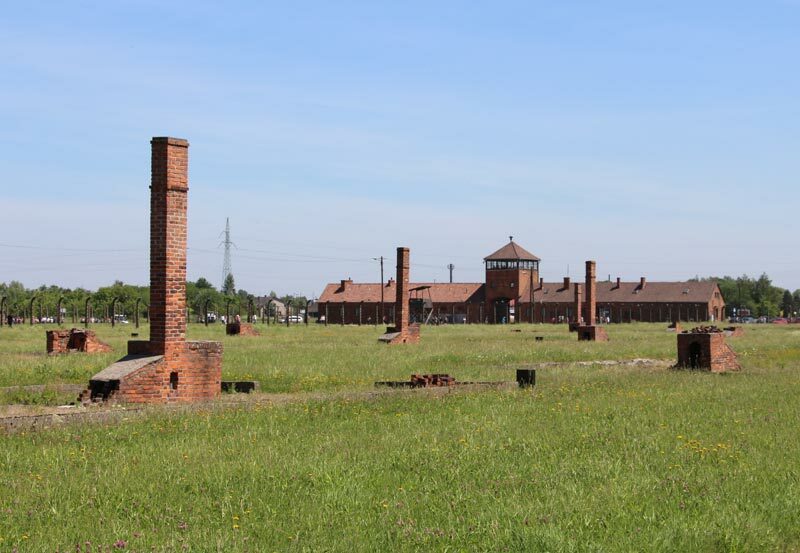 More than a million people were killed and cremated at Auschwitz, and Birkenau houses a small but touching memorial to those whose ashes were left there. 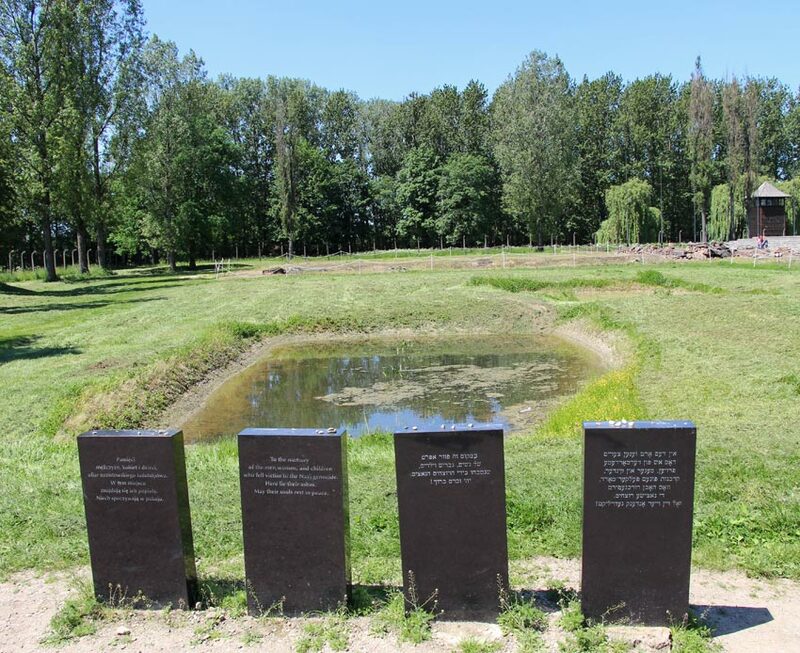 Up to 2,000 people at a time were gassed and cremated, and their ashes were disposed of in what is now a small lake behind where one of the crematoriums once stood. 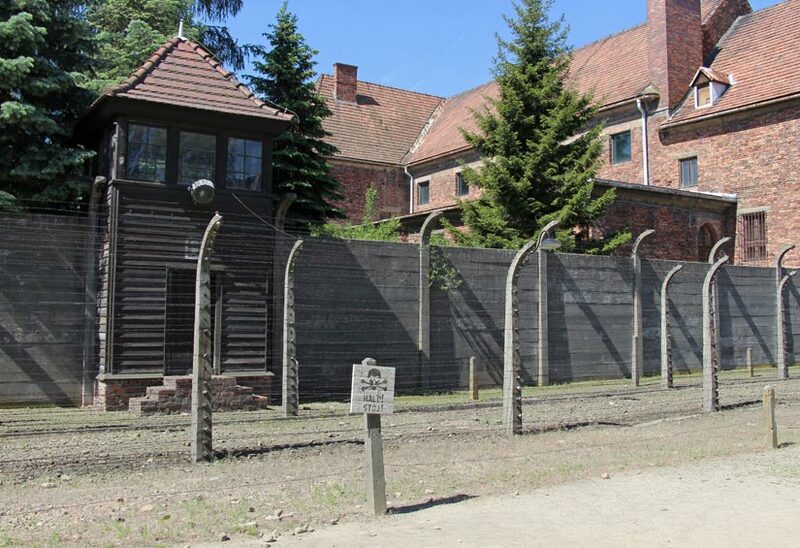 Before Auschwitz was liberated in 1945, the Nazis destroyed huge portions of the concentration camp, including records identifying their prisoners, barracks, buildings, and gas chambers and crematoriums. The destruction is still evident, as many of the dilapidated structures still partially stand. The victims who should not have died in the first place did not receive the burials they deserved. Today, their remains are honored in a still, quiet spot toward a back corner of the camp. As our tour concluded and Adam and I started to walk back toward the entrance, I looked out over the huge field where hundreds of barracks once housed thousands of people. I shifted my gaze up to the bright blue sky and the warm sunshine that streamed down. It was a beautiful day. I thought of the innocent people who were once forced to work on the grounds where I walked, waiting for their bodies to fail them or for a soulless guard to order them into a gas chamber, an unfair and untimely end to a human life. I thought about how many beautiful days they must have suffered through, wishing they could reverse time and go back to a day when a bright blue sky and warm sunshine meant a day full of laughter, joy, and possibility. We can’t reverse time. We can’t change what happened during the holocaust, and we can’t give life again to those who lost theirs. But we can learn about them. We can remember them, visit the places where they were imprisoned and murdered, and we can promise that we won’t allow such horrors to ever happen again. That’s why visiting Auschwitz is so important. It’s easier to fill our vacations with beaches, art museums, and scenic walks. And we should do those things! But we should also take time to reflect and honor the past, especially atrocities like the holocaust. 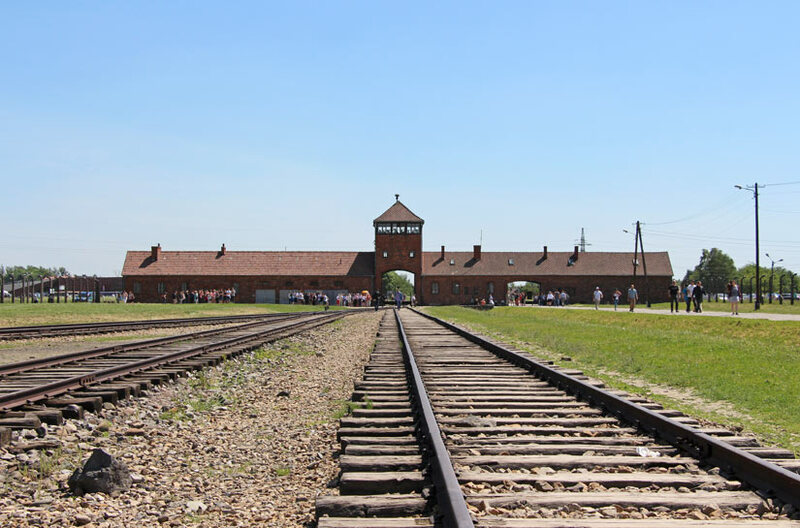 Experiences like visiting Auschwitz will change your life. It’s so important that we never forget what happened there, or at any of the concentration camps throughout Europe. 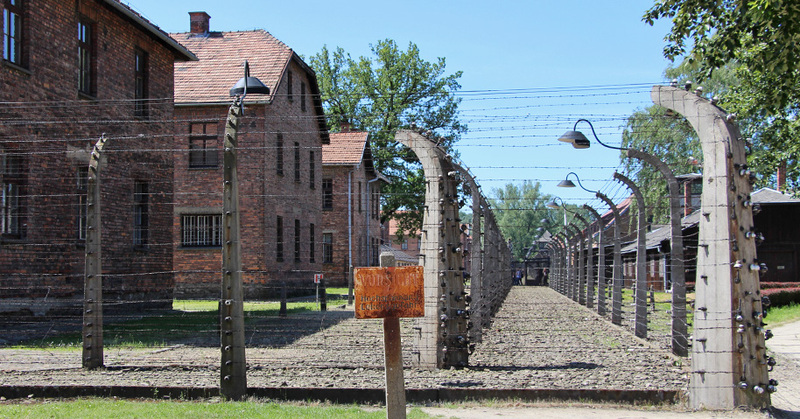 If visiting Auschwitz is something you plan to do, consider spending most of your day there. If we were to do it all again, we would have started with the guided tour and then returned to some of the buildings to view the exhibits unrushed. Give yourself as much time and space as possible to process and reflect. It is an intensely emotional experience. If you are staying in Krakow, take an early morning tour and plan to have a few hours upon your return that are unscheduled. We returned to Krakow in the middle of the afternoon and were very grateful to have a few hours where we could return to our hotel to reflect on our experience. 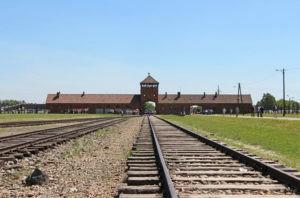 If you are planning a trip to Auschwitz-Birkenau, it’s possible to visit by taking a guided tour (as we did), public transportation, or by self-driving. 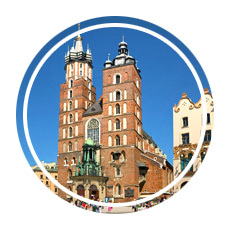 Our friends at Wyld Family Travel share some great tips on how to get there from Krakow. One final piece of advice: go light on the photos. 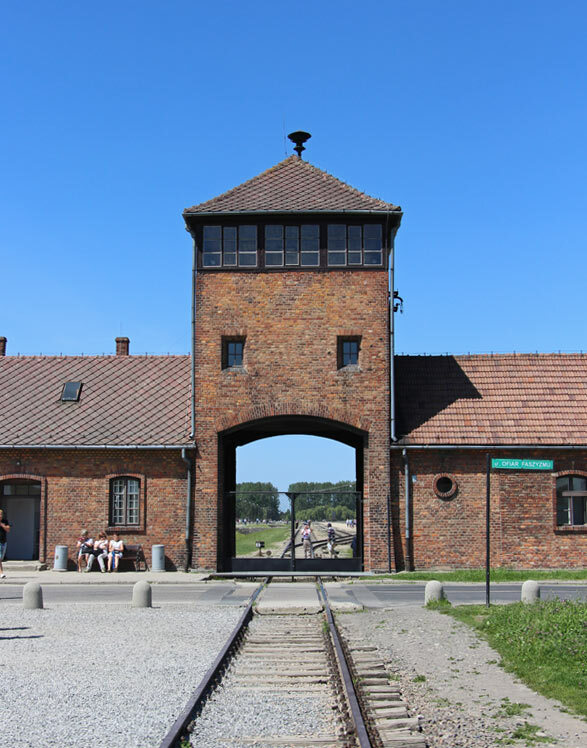 I was saddened by the number of people who felt it was appropriate to take selfies in front of the shooting wall, under the main gate, and outside of the gas chambers. 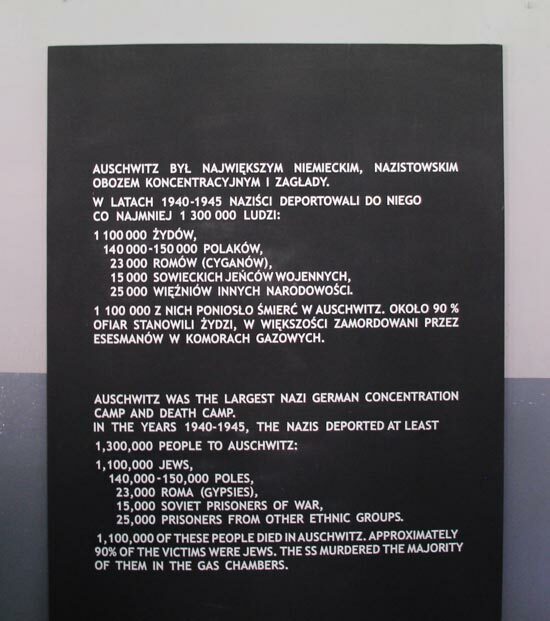 Millions of people perished at Auschwitz. Honor their memories without thinking about your next Instagram photo. I don’t know if I will return to Auschwitz. Like my visit to the United States Holocaust Memorial Museum in Washington, DC, I think my visit will be a once-in-a-lifetime experience that doesn’t need to be repeated. Those hours spent at Auschwitz-Birkenau were life-changing nonetheless. It’s an important testament to humanity’s need to always remember what happened there and refuse to let it happen again.